Last week I was showing a new friend our backyard. I was disappointed to find that my roses were not doing well. They were scraggly and very few blooms were left. A few of the bushes were even being strangled by vines. My friend suggested cutting off the dead heads or old flowers and of course taking care of those pesky vines. The next day as I saw our guard out weeding the flower beds, I asked him to do just that. Not even a week later I took the above picture. Where no blooms were in site, now stands a beautiful flower. All the bush needed was to get rid of the things that were getting in the way of new life. This week I have been feeling like those scraggly rose bushes. I was tired and a little on the grouchy side. My weekly tasks were not getting done. One of my classes would not pay attention. Then not being able to find something put me over the edge. 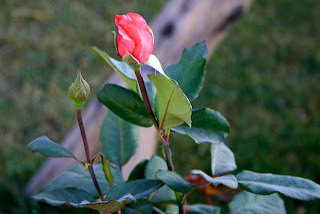 As I looked at the new bloom on the rose bush, a verse from Hebrews came to mind where the writer asks us to "throw off everything that hinders and the sin that so easily entangles, and let us run with perseverance the race marked out for us." Then this morning the speaker at our fellowship talked about forgiveness. He quoted a guy named Smeed who said, "To forgive is to set the prisoner free and discover the prisoner was you." Just like that rose bush, I needed some time with the master gardener who could take off those dead ends of unmet expectations, frustrations and once again remind me to let go and not take back those things I have already forgiven. So I am hoping that since some pruning has been done in my life, there might be some blooming sometime soon. On a side note, I live in a country that most people think of as forsaken and barren but for some reason roses grow really well here. Just a reminder that God can help us to bloom in any land or place that he has placed us. Lovely picture and great words of exhortation! Thank you, Friend!